Article publicat a les actes del XII International Forum Le vie dei Mercanti (un congrés del 2014 desenvolupat a Nàpols i Capri). En aquesta entrada es reprodueix íntegrament l'article. The ancient temple dedicated to the Roman Emperor Augustus on the hilltop of Tarraco (today’s Tarragona), was the main element of the sacred precinct of the Imperial cult. It was a two hectare square, bordered by a portico with an attic decorated with a sequence of clypeus (i.e. monumental shields) made with marble plates from the Luni-Carrara’s quarries. This contribution presents the results of the analysis of a three-dimensional photogrammetric survey of one of these clipeus, partially restored and exhibited at the National Archaeological Museum of Tarragona. The perimeter ring was bounded by a sequence of meanders inscribed in a polygon of 11 sides, a hendecagon. Moreover, a closer geometric analysis suggests that the relationship between the outer meander rim and the oval pearl ring that delimited the divinity of Jupiter Ammon can be accurately determined by the diagonals of an octagon inscribed in the perimeter of the clypeus. This double evidence suggests a combined layout, in the same design, of an octagon and a hendecagon. Hypothetically, this could be achieved by combining the octagon with the approximation to Pi used in antiquity: 22/7 of the circle’s diameter. This method allows the drawing of a hendecagon with a clearly higher precision than with other ancient methods. Even the modelling of the motifs that separate the different decorative stripes corroborates the geometric scheme that we propose. Keywords: Tarraco, clypeus, Augustus, geometry, hendecagon, Pi-approximation. This article suggests the existence of a geometric model used for shaping monumental clypeus of the sacred enclosure of Tarraco, which are preserved at the National Archaeological Museum of Tarragona. This proposal is a result of collaboration between architects from the Technical Superior School of Architecture (ETSA) from Rovira i Virgili University (URV) and archaeologists from Catalan Institute of Classical Archaeology (ICAC), from the interchange of knowledge applied to photogrammetric documentation of architectonical heritage as a previous step of the functional and chronological analysis of their structural elements. The enlargement of the Imperial cult developed in provincial capital a homogenous architectural and artistic language, which was based on the monumentality of Imperial Forum in Rome. In the case of Tarraco, the attractiveness of the hilltop sets up a true religious acropolis, where, through centuries, the main worship building of the city had been superimposed. In this context, the current investigation locates, under the medieval cathedral still in use today (fig. 1e), the worship octastyle temple devoted to Emperor August (fig. 1d), built from Tiberius’ period emulating Mars Ultor Temple. Afterwards, this aedes was preserved during the final transformation of the acropolis into monumental headquarters of the Concilium Prouinciae Hispaniae Citeriores. So that Augustus Temple was kept in use in the centre of a new square erected in the Flavian period (fig. 1a); image and likeness of Forum Pacis, in this case. So was introduced a new model of imperial urban sanctuary with formal similarity as Cigongnier in Avenches or Courseul Forum . The new sacred square was delimited by a monumental portico completely made of marble from Luni Carrara and whose colonnade held up an entablature compounded of architrave, frieze and cornice. Over the entablature an attic showed a succession of clypeus with Jupiter-Ammon’s figure, clearly inspired in the portico of Forum Augustum. Most of the clypeus recovered from Tarragona correspond a syncretic image of Jupiter-Ammon while, for the time being, the identification of another mythological figure is doubtful. A possible fragment of clypeus could reproduce a model of Medusa, although it is not entirely sure (see  fig. 3.5). If it is so, this model is related with other emblems of Medusa decorated in base of straight and oblique tabs  . This possibility could be related to an iconographic programme of porticoed gallery with attics decorated by an alternation of Jupiter and Medusa clypeus, documented for first time in Flavian period (see  p. 575). In Tarraco, and unlike the first model of Forum Augustum or in the copies of Pozzuoli and Mérida, separation between clypeus would be performed through panels divided by vegetal candelabrum, as it is found in the cities of Avenches and Arles, or in the forum of Nyon (see  p. 567). The analysis of the recovered fragments, either clypeus elements or candelabrum reliefs, show an average thickness around 16 cm. Regarding clypeus diameter, E. Koppel had achieved around 150 cm , this measurement was modified by R. Mar and P. Pensabene (1,35 cm  p. 135); our photogrammetric restitution shows around 160 cm. Fig. 1: At left: Building complex of the Concilium Prouinciae Hispaniae Citeriores (Provincial Forum), overlaid to the current urban trace and the plan of the Cathedral. Sacred Precinct (a. 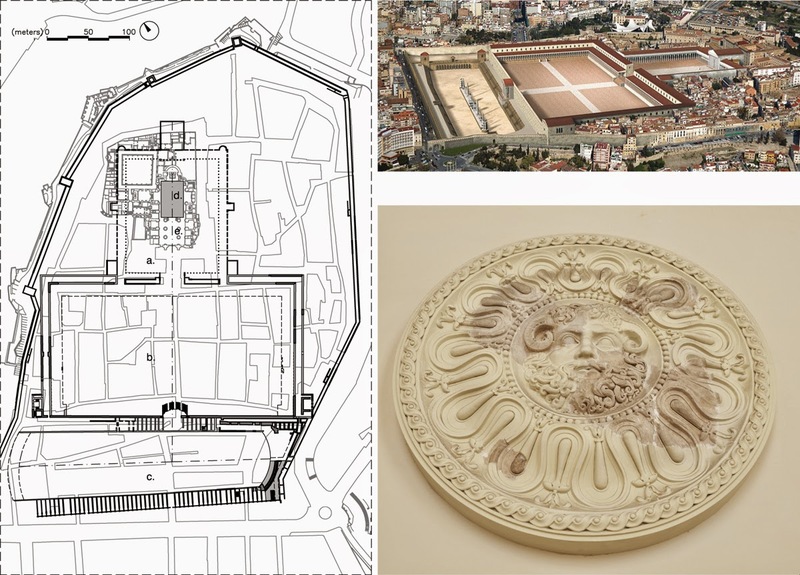 ), Representation Square (b), Circus (c.), approximate position of the Temple of Augustus (d.), Cathedral (e.). Top right: virtual image, Concilium superimposed on the present city of Tarragona. Bottom right: photograph of the clypeus exhibited in the National Archaeological Museum. Fig. 2: Clypeus from Imperial Forums: a. Tarragona; b./d./e. Roma  ; f./g./h. Mérida ; c./i. Pozzuoli . 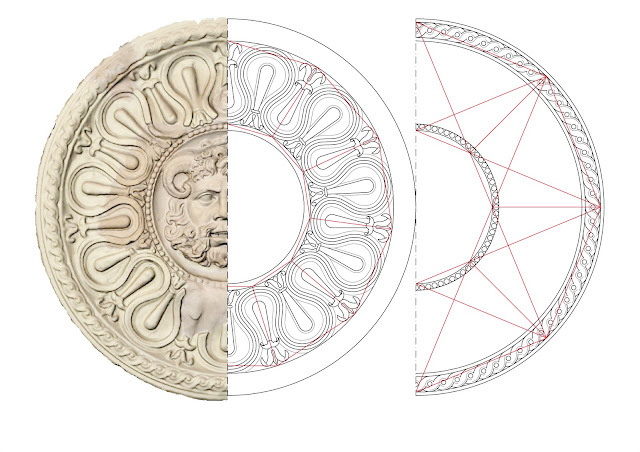 Planimetry of Roman architecture used to be based on simple arithmetic operations, the layout of basic shapes (triangles, squares, rectangles, circles) and their manipulation with ruler and compass (fig. 3). This allows to easily obtain derived figures (e.g. the hexagon, the octagon), as well as immeasurable proportions (e.g. the golden section ratio Φ, √2, √3). Fig. 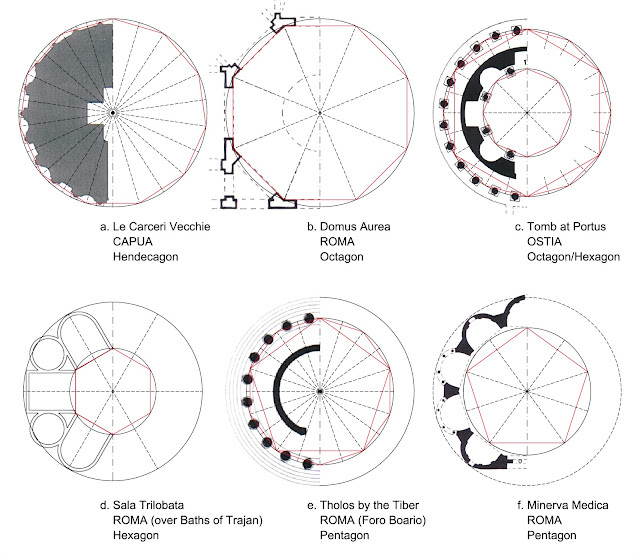 3: Basic geometries of Roman architecture. Typically, central plan Roman buildings (or interior spaces) are articulated from hexagon and octagon. Vitruvius, in the 6th chapter of the 5th book, describes the laying out beginnings of a Latin theatre using four triangles inscribed in a circle, forming a dodecagon, that is, the first subdivision of a hexagon. The Domus Aurea (fig. 4b.) and the Domus Augustana have octagonal rooms, the same geometry we find in the central islands of Leptis Magna Forum and in many rooms of thermal buildings. The 4th-century villa, constructed over the Baths of Trajan (fig. 4d), has a hexagonal layout, as it happens in a courtyard of the Jupiter Heliopolitanus Sanctuary in Baalbek or the columns that surround the inner courtyard of the rotunda-mausoleum built by Constantine in Rome (Santa Costanza Church). We can consider Hadrian’s Villa as the culmination of this Roman geometric articulation system for architecture: the so-called Academia and Teatro Marittimo has a plan based on an intricate layout draft by circles centered at the vertices and axes of an octagon. In the tomb of Portus (fig. 4c.) we can even identify a simultaneous use of the hexagon and the octagon in the same building: the inner room is laid out by an octagon, while the outer peristyle consists of 24 columns, the result of dividing two times a hexagon. These considerations on the large scale can be transferred to architectural decoration, with column shafts with 24 (4x6) striae, vegetal decorations with hexagonal or octagonal flowers, etc. The use of more ‘sophisticated’ regular polygons, as the pentagon, the heptagon or the hendecagon, is less common, but we can give some examples. The statue group known as the Dying Gaul in the Capitoline Museum has a pentagonal diagram inscribed on its base (see  fig. 3.7). The tholos by the Tiber at Rome (fig. 4e), at the Forum Boarium, has a peristyle of 20 columns, probably the result of subdividing 2 times a pentagon. The so-called Temple of Minerva Medica (fig. 4f), in the Licinianos Gardens of Rome, presents a plan structured through a decagon, the first subdivision of a pentagon. We have only found a Roman building that we can attribute to a hendecagon based geometry. The tomb at Capua known as Le Carceri Vecchie has a circular base with 22 modules, the result of subdividing a triangle or, as discussed below, applying the approximation of Pi given by Archimedes to laying out an architectural plan: according to Mark Wilson Jones  (fig. 4.7d, p.75) its diameter is 70 feet, while the 22’s intercolumniations of the facade are 10 feet, which leads us directly to the fraction 22/7. We return now to the decorative element typology that concerns us here. Some of the clypeus from the Imperial Forums in Rome has a decorative crown articulated by an octagonal geometry, as we have verified in figures 2d y 2e. In both cases we have analysed reconstructive drawings published by Lucrezia Ungaro  (2007, p. 155, fig. 203)  (2004, p. 22, fig.15). We also found the octagonal geometry in Mérida Forum clypeus fig. 2f/2g). Especially significant is the case of clypeus 2g: we have restored its geometry from the photograph published by José Luis de la Barrera  (lamina 83, Cat. 229), who considers that because of the fineness of its carving, and the fact of being the only Carrara marble clypeus of the whole Forum, can be attributed to a master stonemason that would set the model to follow. The clypeus 2f ( lamina 92, Cat. 243) is a piece almost entirely preserved; strangely, in the drawing provided by Barrera ( in fig. 26) the outer crown is divided in 34 parts, instead of the 32 (4x8) which can be counted in the picture. Concerning the hexagon, we identify it in the geometry of a clypeus with anthemion at Pozzuoli (fig. 2i) that shows the reconstructive drawing published by Fausto Zevi and Claudia Valeri (in  figure 10, p. 457). Fig. 4: Central plan Roman buildings. Key geometrical scheme overlaid to the drawings published by Mark Wilson Jones  and John B. Ward Perkins . Can we mention clypeus based on more exotic regular polygons? Yes, but with some cautions. There is a Mérida clypeus which seems to correspond to a heptagonal geometry (fig. 2h). In the José Luis Barrera picture on which we base our geometric analysis  (illustration 95, Cat. 245) can be distinguished large reconstructed areas. However, we note a great uniformity in the size of the 28 pods that form the crown (4x7, two subdivisions of a heptagon), which gives us confidence in the validity of the restitution. In the clypeus integrated into the reconstruction of the portico of the Mars Ultor Temple temenos, (fig. 2b) provided by Lucrezia Ungaro  (p. 154, image 202), we can distinguish two rings around the central medallion: the internal decorated with feathers and the external with pods. The second consists of 44 pods, a hendecagon divided twice. The decorative scheme of Rome clypeus 2b is repeated on the clypeus of Pozzuoli 2c. On the basis of the reconstructive drawing published by Zevi and Valeri  (p. 459, image 12), we consider that in this case the hendecagon figure establish the geometry of the inner decorative ring. Our initial hypothesis for the clypeus of Tarragona was that the reconstruction of the meanders crown shown at the National Archaeological Museum was wrong. We believed that an accurate survey of the original fragments would determine a decorative crown marking from a 12-sided polygon, a simple subdivision of a hexagon, or 10-sided, a subdivided pentagon. We were wrong. We conducted a 3D survey of the reconstruction exhibited at the Museum through Autodesk’s 123D Catch software, exporting the generated 3D model in OBJ format and analyzing it using CAD programs Rhinoceros and Autocad. A close examination of the original parts allowed us to determine that the pods between each meander module were arranged forming an angle between 32.5º and 33º, very similar to the 32.72º of a regular hendecagon, and sufficiently far from the 36° that would correspond to a decagon or the 30º of a dodecagon, so as not to have doubts about the figure that was used to compose the piece. This finding led to a new question, and very interesting: how this hendecagon was laid out? We are not facing a building plan, the Clypeus is a decorative piece, yes, but its dimensions and the precision of the execution seem to rule out a marking based on trial and error. Also has to be keep in mind that we refer to a series of quadrangular marble plaques of, approximately, ½ Roman foot thick (14.8 cm) and about 5½ feet sideways (162.8 cm), weighing nearly a ton. They all had to fit in the attic of the portico, and its design should articulate with the corresponding architectural modulation, while its carving obeyed standard parameters that involved an organizational template, previously to chiselling relief and repeated for each marble panel. The exact construction of a hexagon or a regular octagon is obvious. In the first case is sufficient to mark the radius of a circle around its circumference. In the second has to be inscribed a square in a circle and then drawn the bisector of its sides. The pentagon can also be accurately plotted with ruler and compass, but with slightly more complicated operations, not obvious to someone without advanced knowledge of geometry. Does not exist, however, an exact design to draw a hendecagon  (nor for the heptagon and other regular polygons ). Therefore, to draw a hendecagon with ruler and compass it is necessary to resort to approximate constructions. In table 1, by the end of this paper, we summarize the length of the sides and the deviations from a regular hendecagon for all layouts discussed. In figure 5 we show a first approximation, quite complex and unintuitive, that provides a construction with relatively small deviations: while a regular hendecagon inscribed in a circle of diameter Ø=1 has 11 sides of equal length L≈0.2817, with this complex approximation we obtain 7 sides with L≈0.2828 (a deviation of +0.37%) and 4 sides with L≈0.2799 (a deviation of -0.65%). Fig. 5: Complex approximation to a hendecagon construction. A simple approximation to the hendecagon construction involves dividing the radius of the circumference which is inscribed in 25 parts, and then take 14 to draw a side (fig.6). The resulting figure has 10 sides where L=0.28 (a deviation of -0.61%) and a side where L≈0.2990 (with a considerable deviation of +6.13%). According to Thomas Heath , this solution was already known in classical Greece, and is perfectly consistent with the Greco-Roman geometrics operations: is based on a simple fraction, 25/14, a formulation similar to approximations of Pi proposed by Vitruvius and Archimedes. Indeed, in the next section, we will rely on the Archimedes’ approximation of Pi to propose various alternative constructions for hendecagon. Fig. 6: Simple approximation to a hendecagon construction. 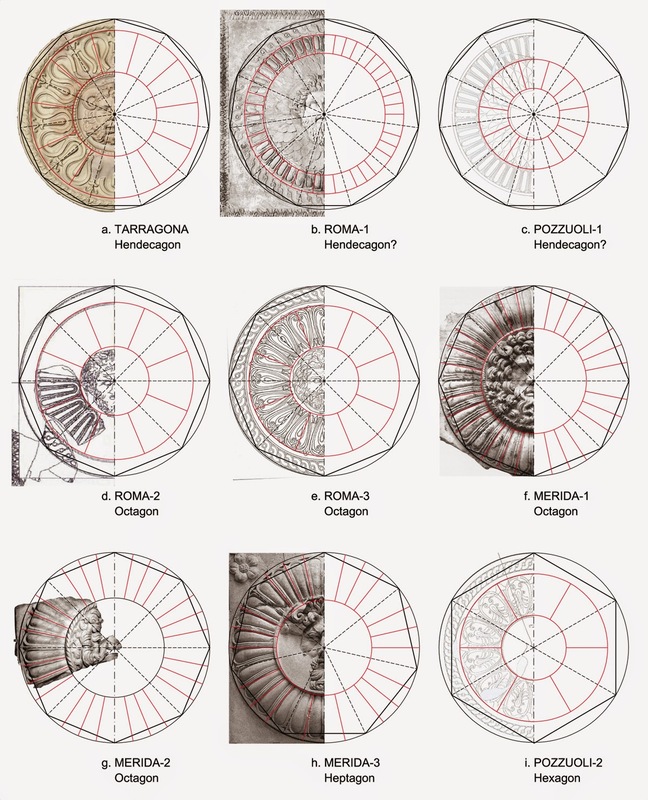 As we have seen, some of the clypeus from the Forum of Augustus at Rome, the reference model for Tarragona’s Sanctuary, clearly present a geometry derived from octagon (fig. 2d y 2e). Apparently this is not the case in Tarragona: meanders of the outer ring of the clypeus are not laid out, as expected, by a subdivision of the hexagon or octagon. Instead we found a hendecagon defining its geometry. However, if we inscribe an octagon in its outer perimeter the diagonals appear to define with a certain precision the ratio between the outer ring and the central medallion (see right half of fig. 9). But, how can we relate both figures? Then we recall the approximation of Pi given by Archimedes through a numerical procedure for calculating the perimeter of a circumscribing/inscribing polygon of 2n sides, once the perimeter of the circumscribing/inscribing polygon of n sides is known, based on the properties of the bisector of an angle of a triangle described in proposition III of book VI in Euclid’s Elements. Subdividing the hexagon 4 times, Archimedes succeeded in calculating the approximate perimeter of polygons of 96 sides (6x24) inscribed and circumscribed to a circle, establishing Pi value between (3+10/71)≈3.1408 and (3+1/7)≈3.1429. The upper limit can be expressed with a simple fraction, 22/7, that fits well with the practical procedures used by Roman builders to make measurements. Vitruvius himself gives an approximation of Pi expressed in similar terms: right at the beginning of the 9th chapter of the 10th book he describes a method to calculate distances by turning a cart-wheel: if it has a diameter of 4 feet at every turn it will travel about 12 and a half feet, that is, proposes assimilate Pi to the fraction 25/8, an approximation with an error of 0.5%. The Archimedes’ 22/7 represents an error of only 0.04%, an order of magnitude lower; obviously his work was known in the Roman world, and it is reasonable to think that was within the mathematical background available for Roman builders. On the other hand, we can use the Archimedes’ fraction to perform an approximate hendecagon construction. We have already seen that Wilson Jones  proposes for Le Carceri Vecchie at Capua (fig. 3.a) a width of 10 feet for each of the 22 facade modules, while the diameter of its circular plan would be 70 feet; namely, he directly refers to the fraction of Archimedes. Obviously, a regular polygon of 22 sides allows us to draw a hendecagon joining vertices 2 by 2, but the direct application of the fraction 22/7 produces a considerable error in the layout. In the left construction of figure 7 we have divided the diameter of the circle which it is inscribed in 7 parts, an operation that can be easily performed with the theorem of Thales or picking a metrology that facilitates the division (e.g. the 70 foot diameter plant of Le Carceri Vecchie). If we mark Ø/7 along the perimeter of the circumference we obtain an hendecagon in which 10 sides have a length L≈0.2828Ø and 1 side where L≈0.2712Ø; regarding regular hendecagon (where L≈0.2817Ø) we have an approximation of its layout on which 10 sides have an error of +0.37% and 1 of -3.74%. We can refine this system subdividing the diameter modulation. If we divide it into 14 parts and we mark Ø/14 along the circumference (central construction of fig. 7) we have 10 sides where L≈0.2821Ø (+0.12% deviation) and 1 side with L≈0.2783Ø (-1.22% deviation). A new subdivision of the diameter, now up to 28 parts (right construction of fig. 7), improves the accuracy, with 10 sides where L≈0.2819Ø (a deviation of +0.06%) y 1 side with L≈0.2800Ø (a deviation of -0.60%). Fig. 7: Approximate construction of a hendecagon through Archimedes’ approximation of Pi. The subdivision process of the diameter of the circle may continue, getting better and better approximations to a regular hendecagon. But we stop at the second subdivision, which involves expressing the Pi approximation 22/7 by the fraction 88/28. For a circumference of 1 meter in diameter (Tarragona’s clypeus are slightly wider, having an overall diameter of around 1.6 meters) we have, theoretically, a deviation of 2 mm in the worst side and of 2 tenths of a millimeter in the remaining 10 sides, an error within the graphic tolerances when drawing over a stone slab. The problem here would be the accumulation of errors: would be necessary to transfer 88 times on the circumference of a circle the subdivision in 28 parts of its diameter. This is where the octagon comes in. Since the numerator of the fraction 88/28 is divisible by 8 we can adjust the laying out by first drawing the diagonals of an octagon, a trivial and accurate operation, to restart the marking of 11 modules in each of the eight arcs of a circle defined by the octagon (see fig. 8), thus avoiding much of the possible distortion caused by the accumulation of errors. Fig. 8: Approximate construction of a hendecagon combining the octagon with the Pi approximation. This solution provides an approximation to the hendecagon indistinguishable from the regular polygon in the laying out of a decorative piece with the size of the clypeus studied here, as can be checked in the table 1 in which we summarize the deviations of the constructions we have presented. Fig. 9: Proposed geometrical scheme for the clypeus, compared to the orthophoto of the piece exhibited at the National Archaeological Museum of Tarragona. The clypeus reconstruction of the National Archaeological Museum is correct. Therefore we are facing a singular case: the use of a hendecagon to fit an architectural decoration. The Forum of Augustus in Rome was the reference parallel for building the Imperial Sanctuary of the Conciclium Prouinciae in Tarragona and other similar complexes, its reproduction served to transfer to the provinces a monumental architecture that exalted the Imperial cult. In the case of Rome the geometry of the clypeus that decorated the porticos was based mainly in the octagon, a common figure in the geometry of Roman architecture. In Tarragona we find a hendecagon, but we have managed to establish a possible connection between its layout and the octagon through a Pi approximation, well known in classical antiquity: 22/7. Moreover, the octagon diagonals seem to establish exactly the proportions between the outer ring and the inner medallion, so we could consider that the geometries of Tarragona and Rome clypeus were not so distant. Alternatively, we propose a second hypothesis for drawing the hendecagon: to use the 14/25 fraction of the radio of the circle in which was inscribed, we call it the simple approximation. Finally, it could be proposed a combination of both solutions: the octagon would serve to establish the main proportions of the piece, while the simple approximation for the hendecagon construction would serve to inscribe the meanders ring. Anyway, we can see how Tarragona’s enclosure did not follow strictly the parameters of the original model, an aspect that is also seen in the use of panels with candelabrum as separation of clypeus, unlike the Forum Augustum in Rome and other monumental complex, that incorporated caryatids decorating their attics. BARRERA ANTÓN, José Luis. La decoración arquitectónica de los foros de Augusta Emerita. Ed. L’Erma Di Bretschneider, 2000, 480 p. ISBN 978-8882650346. HEATH, Thomas. A History of Greek Mathematics. Vol. 2. Clarendon Press, 1921. KOPPEL, E.M. Relieves arquitectónicos en Tarragona. Stadtbild und Ideologie (Madrid 1987), Bayerische Akademie der Wissenschaften, Supplements, New series 103, Munich, 1990, p. 327-340. LaROCCA, Eugenio; UNGARO, Lucrezia; MENEGHINI, Roberto. I luoghi del consenso imperial. Il Foro di Augusto. Il Foro di Traiano. Roma: Progetti Museali Editore, 1995, ISBN-978-8886512022. MACIAS, J. M.; MENCHON, J.; MUÑOZ, A.; TEIXELL, I. La construcción del recinto imperial de Tarraco (provincia Hispania Citerior), In LÓPEZ, J., MARTIN, Ò. (ed. ), Tarraco: construcció i arquitectura d’una capital provincial romana, Butlletí Arqueològic 32, Tarragona, 2011, p. 423-479. MACIAS, J. M., MUÑOZ, A., TEIXELL, I., MENCHON, J. J. Nuevos elementos escultóricos del recinto de culto del Concilium Provinciae Hispaniae Citerioris (Tarraco, Hispania Citerior). In NOGALES, T.; RODÀ, I. (ed. ), Roma y las provincias: modelo y difusión (Hispania Antigua, Serie Arqueológica, 3), XI Coloquio Internacional de Arte Romano Provincial (Mérida 2009), Roma, 2011, p. 877-886. MAR, R., PENSABENE, P. 2011: Financiación de la edilicia pública y cálculo de los costes del material lapídeo: El caso del foro superior de Tárraco. In LÓPEZ, J., MARTIN, Ò. (ed. ), Tarraco: construcció i arquitectura d’una capital provincial romana, Butlletí Arqueològic 32, Tarragona, 345-413. PEÑA JURADO, A. Decoración escultórica. In AYERBE, R.; BARRIENTOS, T.; PALMA, F.; (ed. ), El foro de Augusta Emerita. Genesis y evolucion de sus recintos monumentales, Anejos de AEspA LIII, Anejos de Archivo Español de Arqueologia, Mérida, 2009, p. 543-581. UNGARO, Lucrezia. La memoria dell’antico. In Il Museo dei Fori Imperiali nei Mercato di Traiano. Ed. Electa, 2007, p. 130-169, ISBN 978-8837051587. UNGARO, Lucrezia; MILELLA, marina; VITTI Massimo. Il sistema museale dei Fori Imperiali e i Mercati di Traiano. In RUIZ de ARBULO, Joaquín. SIMULACRA ROMAE Roma y las capitals provincials del Occidnte Europeo. Tarragona: 2004, p. 11-48. WARD PERKINS, John. Arquitectura Romana. (Translated by ESCOLAR BAREÑO, Luis). Madrid: Aguilar S.A. de Ediciones, 1989. 207 p. Translation of Roman Architecture, Electa, 1980. ISBN 84-03-60129-8. WILSON JONES, Mark. Principles of Roman Architecture. 3ª ed., New Haven and London: Yale University Press, 2000, 270 p. ISBN 978-0300102024. ZEVI, Fausto; VALERI, Claudia. Cariatidi e clipei: il foro di Pozzuoli. In Le due patrie acquisite. Studi di archeologia dedicati a Walter Trillmich. Ed. L’Erma di Bretschneider, 2008, p. 443-464, ISBN 978-8882655082.